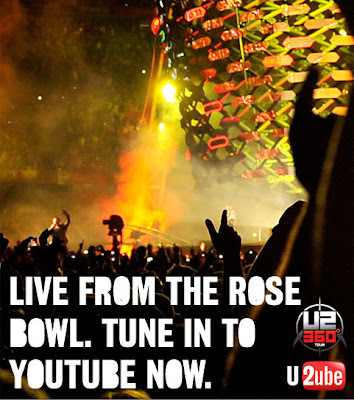 So like this evening I watched the U2's Los Angeles Rose Bowl show that was broad cast live around the world through youtube (U2tube..) The show itself was pretty cool with lots of new songs and a fair mix of the hits (old and new) with a mighty Until the End of the World being a highlight for me. Unknown Caller was pretty darn good too. The technical side of things must have been a production in itself. The stream I had was perfect with good sound quality and minimal buffering required. There were 100,000 LA fans present - how many million were tuned in via youtube I dunno but google/youtube's servers must have served terrabytes and terrabytes of data! The U2 show was a first in many ways - there have been plenty of live broadcasts before but this one is on a massive scale using some of the leading technology. It also works for U2 as well - one could by the new album via a link on the channel which took the follower to U2's Itunes sales medium. So has this concert changed the content model? Will people be more content to sit at home and watch Bono preach at them on their 40 inch tv? Probably not, but more people might be inclined to tune in and follow their fave artists tour. Time will tell - look for what happens when the Rolling Stones tour next! Major world events etc can also be used in this medium. Streamed Olympic Games anyone? Meetings of world leaders? When the aliens finally land? and the obvious - movie and television shows. TV execs and the like must be quietly crapping their pants as they watched - here was premium content being delivered for free with bugger all adverting. Facebook had a little look in....there were no adds during the broadcast at all. HBO suddenly becomes a little redundant when the next Sopranos is shown via the internet only eh?